Sometimes I like to work with the wrinkles that occur naturally in my collages to take advantage of the interesting textures, as shown here with the shape at the top of this collage. 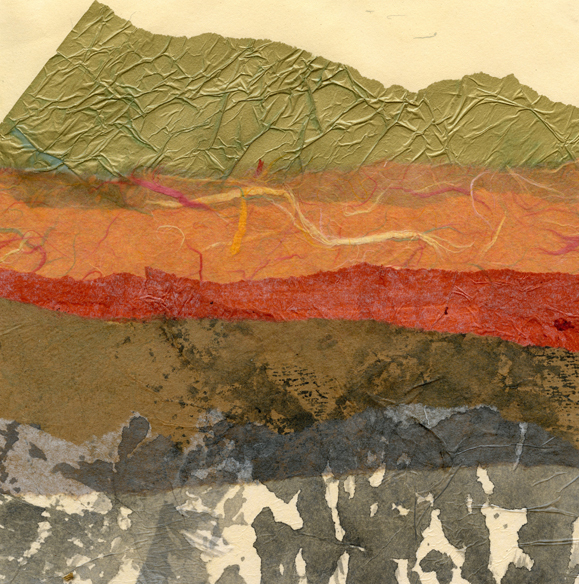 However, if you want a nice smooth surface, here is Jonathan Talbot’s method for fusing collage papers. It requires a little more preparation ahead of time, but is foolproof and works beautifully. If you haven’t tried it, you should. I have used this method off and on since I took one of Jonathan’s workshops, but that’s just about the only thing I will iron. Well, except for the occasional dry mounting of a piece of art to a backing. Clothes are a whole other story. If I want wrinkles out of my clothes, I just spritz them with a little water and toss them in the dryer for a few minutes. Life is too short to iron clothes. I like the wrinkles, think they add character to the piece. Love this collage and the papers used. Thanks Pat. And come to think of it, wrinkles just plain add character to just about anything! Loving your landscapes – and i SO agree that ‘life is too short to iron clothes’!!!!! I don’t have a tumble drier but I fold straight off the line or put straight on a hanger. Thank you, Nicole! And I’ll take rumpled and happy any day! My comment appears to have vanished into cyberspace, apologies if it turns up again and is duplicated. Love this series. I am planning a series of abstract landscape paintings to experiment with some of the effects and colour schemes we’ve done in the course. Are you OK about my basing some on the composition of some of yours? Just as a starting point, the end result would be quite different. I love your attitude towards ironing! Thanks Sandra! They both came through — the first one came through as Anonymous, but since they both had almost all the same text I deleted the first one. Sure, you’d be welcome to use some of the compositions as a jumping off point. Any time, Sandra! Good luck with your painting project. Thanks, Mary Helen! Yes, wrinkles do add character. DJ, so nice to see you. I always appreciate your kind words.